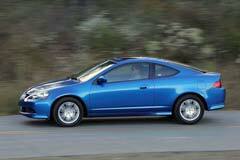 In 2002, the Acura RSX line was introduced to the consumer markets by the Honda Motor Corporation. The model targeted car enthusiasts offering a luxury sports coupe that also provides potential for tuning. Amongst the most popular used Acura RSX models, the K-series has proven to be the most successful. The two available models, the base and the Type-S are differentiated by engine, transmission and several design elements. The base model has a 155 HP engine while the Type-S uses a 201 HP one. From the outside, the cars look almost identical with very few details to separate them. The interior for the Type-S features leather trimmed interior and titanium finished gearshift knob. It comes equipped with 17 inch wheels, sport suspension and billet-style exhaust outlet. The interior of the base model does not have the leather seat covers or the titanium gearshift knob. Also the wheels are only 16 inches and it comes with a standard suspension. Regardless of these differences, used Acura RSX models are equally popular. 2006 RSX w/Leather 2dr Hatchback 5A 2006 Acura RSX, BLACK with 143042 Miles available now!